Let’s make it a community! We also recognized that New York — unlike many cities — already has many strong fans of subway performance. (They don’t always show it on their faces, but polls have repeatedly shown New Yorkers overwhelmingly supporting us, and even getting behind those controversial in-train performers!) This sure seems like the result of post-1985 legalization: if you let talented, dedicated, and generous performers do what they like for nearly 30 years, they can change the face of a city. Nonetheless, we’d like to see New York even more visibly supportive of performers — and we’d particularly like to combat the widespread misunderstandings about subway music. Many folks support us despite thinking that we’re illicit — so let’s take a load of their backs and tell them that music is legal! Here’s the pdf, printable with four flyers to a page. Do you have an idea for a positive/powerful/funny/attention-grabbing/shareable poster? Share the thought with us! 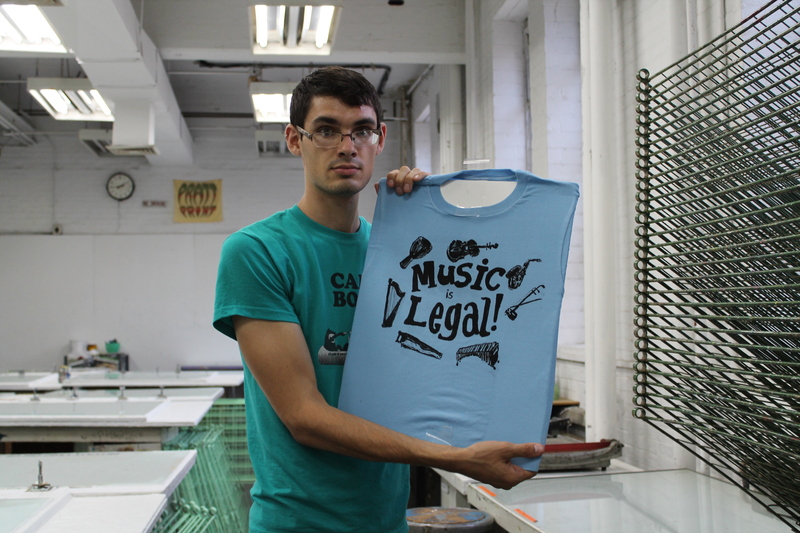 Almost immediately after we started giving them out, we began spotting our “Music is Legal!” t-shirts all over the city. Now that we’ve managed to distribute most of this summer’s supply, we’re creating a gallery of photos performers wearing the shirts. If you have a photo of yourself you’d like to submit, you can send it to BuskNY@gmail.com and we’ll post it in our “Music is Legal!” gallery! We only have a few photos so far, but it would be great to see more people showing support! Meanwhile, I’ve been working on setting up my own silkscreen equipment, so I can make even better shirts, with a new design, next year. 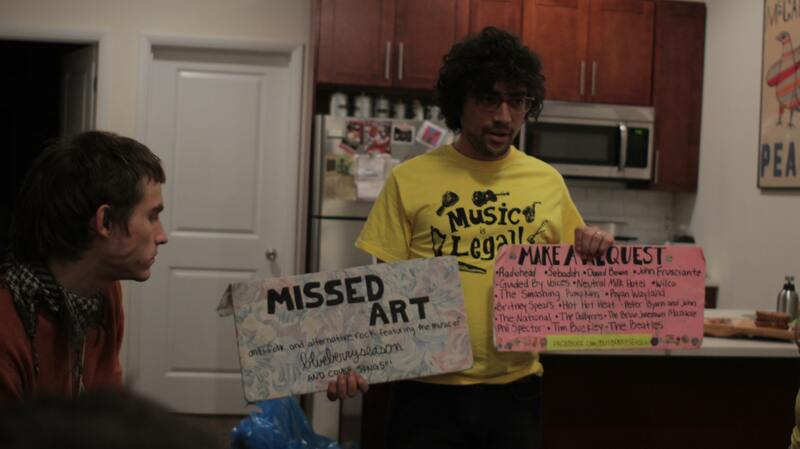 Also, don’t forget that our “Music is Legal” event at Armature Art Space in Bushwick is this Monday night! We hope to see you there! 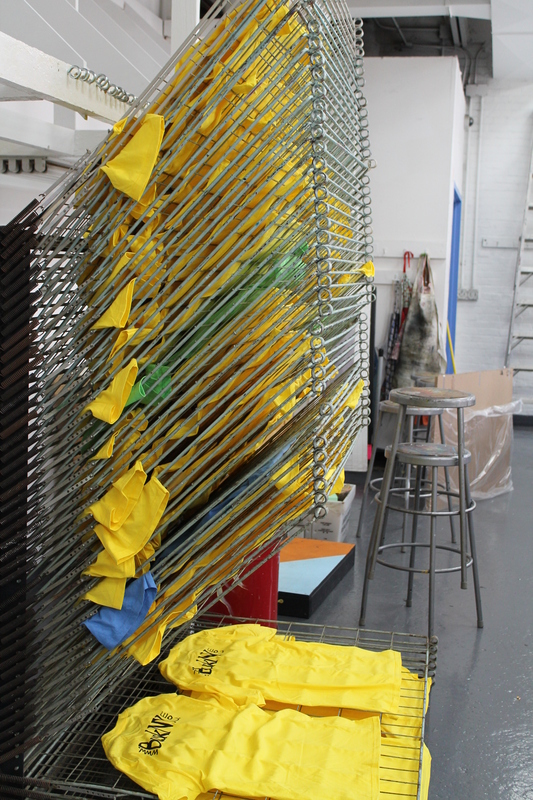 The shirts arrived Thursday evening, and since I only had two days available to print them before losing access to my studio space (and I’m spending Sunday helping to install my show at the Painting Center), we had to rush to get them done. 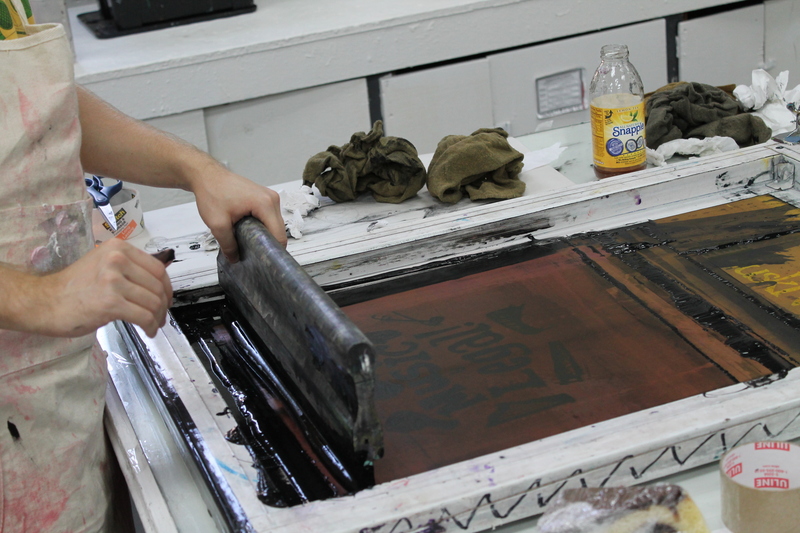 With only two people, it took seven or eight hours to finish the front side of all 135 shirts. We started with the pink shirts. 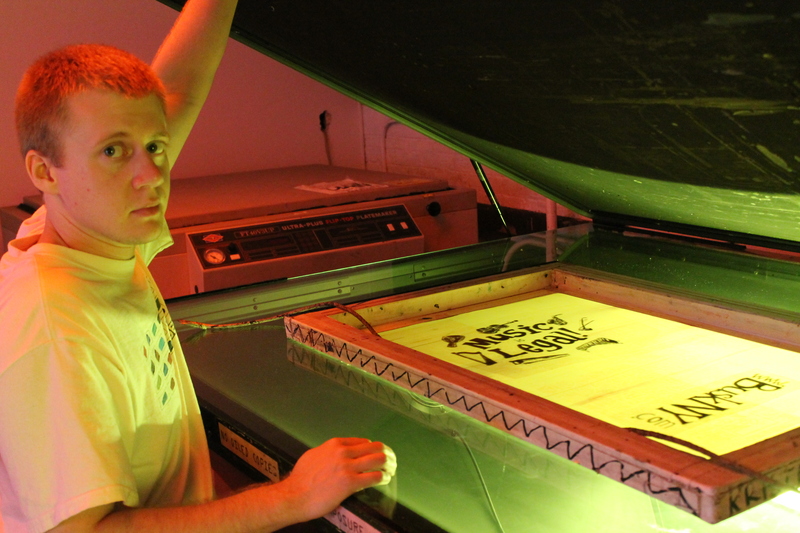 My cousin Zeke took a detour into the city on his way up the Appalachian Trail, and he offered to help us print the backs. With his help, we finished them in four hours. And he bought us food! 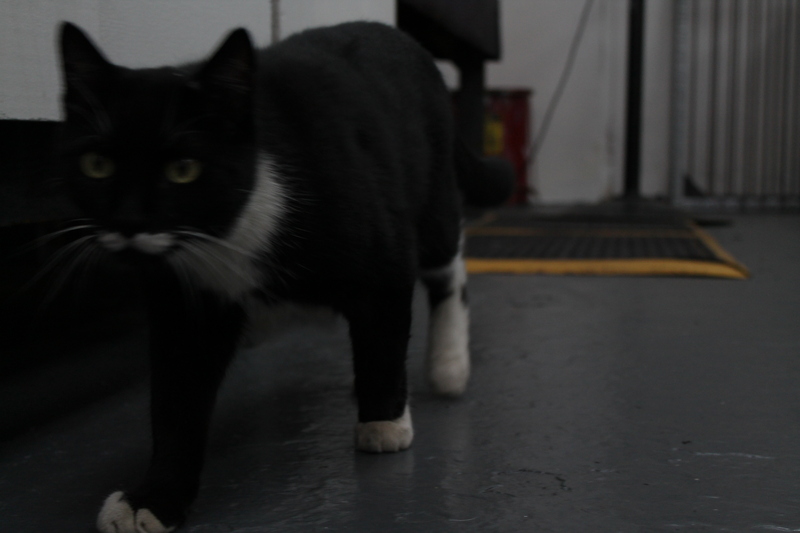 The print shop’s mustachioed Pratt Cat, who is most often found sleeping in the paper guillotine’s scrap bin, visited us in the silkscreen lab. 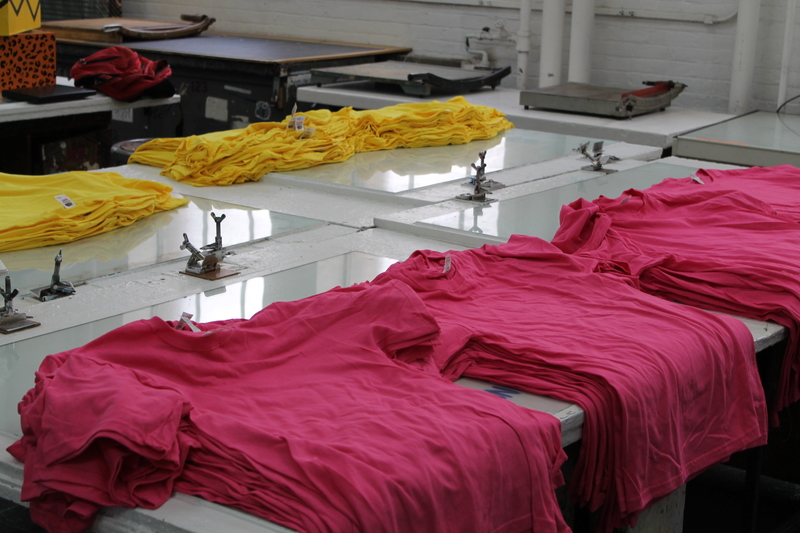 About half of the finished shirts. Matthew and Kalan will start distributing them to subway performers this week. 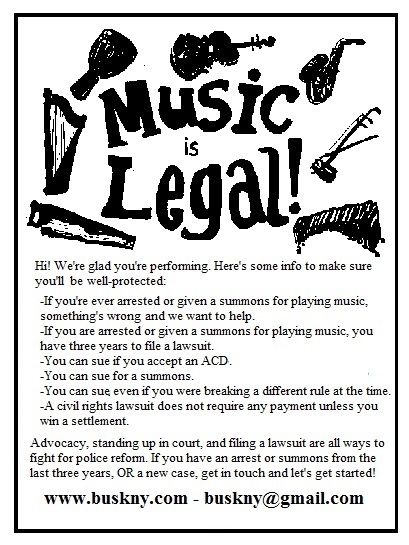 Remember: Music is Legal! 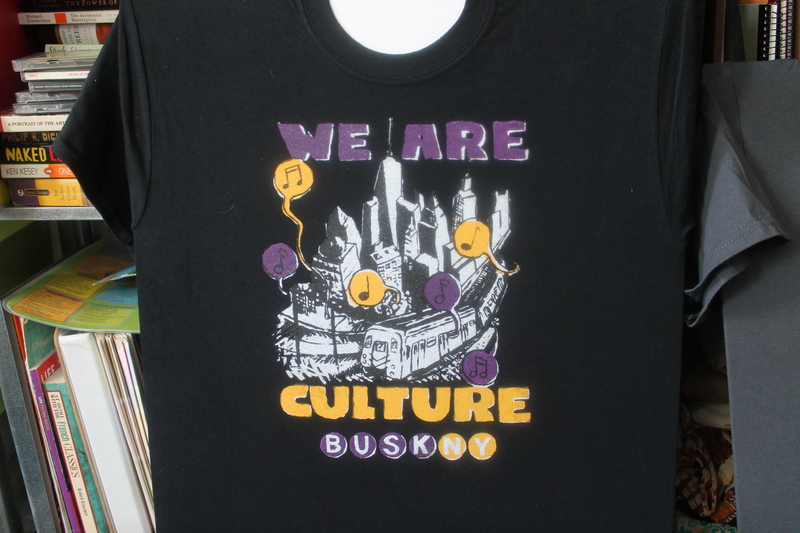 As promised, today was spent hard at work on the sample run of BuskNY t-shirts. 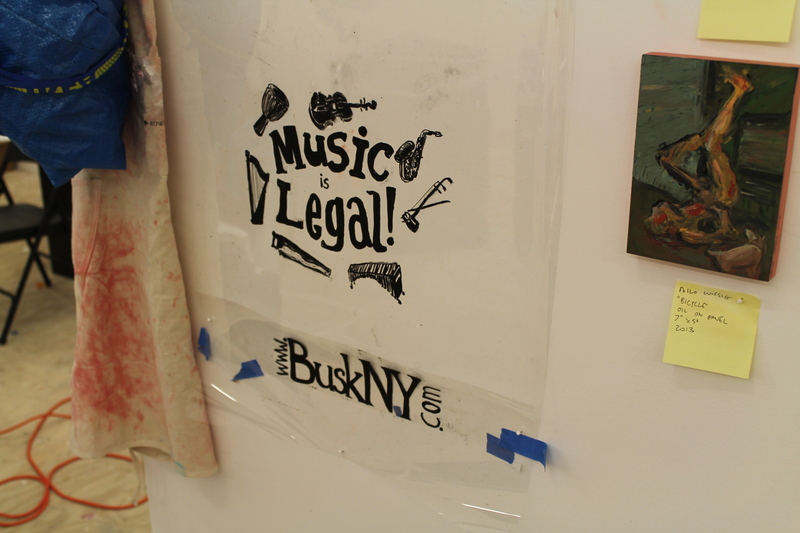 (I can disclose by now that we’re planning a Kickstarter, with one modest goal: equipping every last NYC busker with a bright, dashing “Music is Legal!” t-shirt). 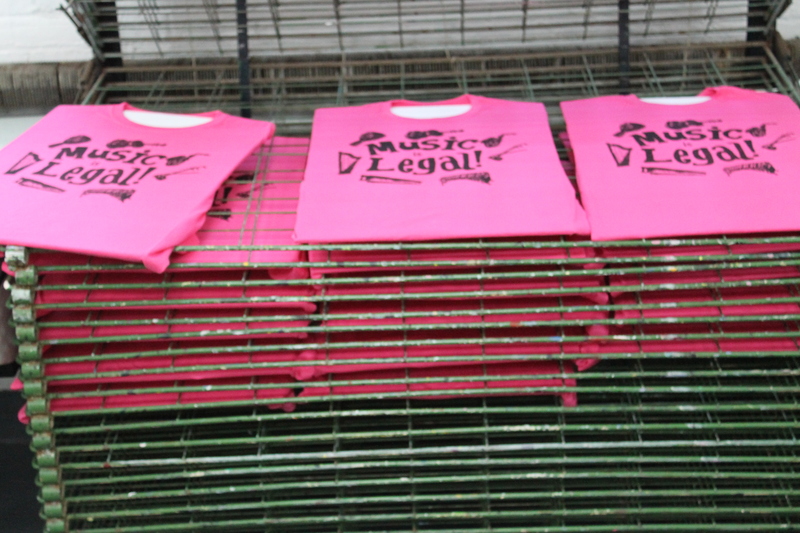 We started with the acetate sheets, which Milo had inked with the “Music is Legal!” design. 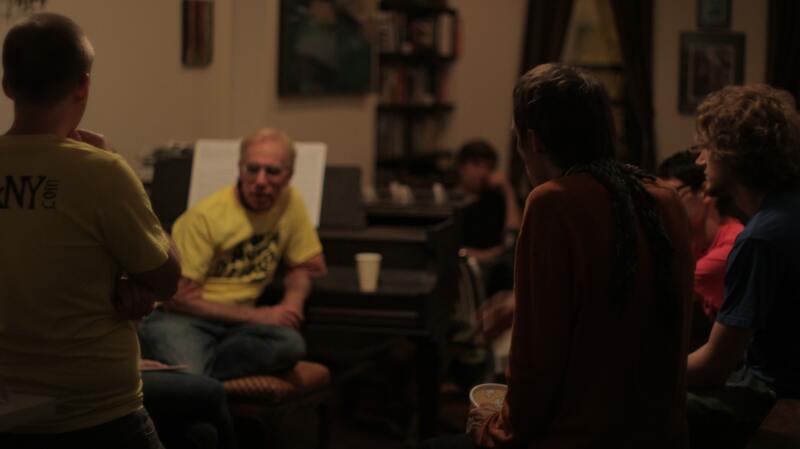 We also spent a number of hours filming and editing for the Kickstarter video, which is now complete. We had a lot of fun with it, and think you will too. The Kickstarter approval process takes a few days, so stay tuned — it’ll be up before we know it! In the meantime, we’ll be back to regular busking updates soon. After all, one’s gotta make rent somehow around here!